The new 2018 Hyundai Creta will remind of your high-school batchmate who always had good height and a healthy body and all of sudden went to the gym and completely transformed his body and added more muscle to enhance his macho looks. It’s the face of the new Hyundai Creta that gets most changes and the chrome on the front grille has now disappeared. It has now replaced by the Hyundai’s signature cascade grille that makes the Creta more aligned to its family design. The front grille along with more muscle on the front bumper makes the new Hyundai Creta look very aggressive and the fog lamp unit on the top-variants also gets a new housing. In addition, the headlamp cluster now gets bi-focal projector headlamps with DRLs that add to the already premium-looking design. The other big highlight on the new Hyundai Creta is the dual-tone colour scheme on the A-pillar finished in gloss black. This is a major differentiator over the previous Hyundai Creta and is certainly going to appeal a lot of buyers. Overall, the dimensions of 2018 Hyundai Creta remains unchanged but the front and rear bumpers get grey skid plates that add a bit of ruggedness to the character of the Creta. The rear of the Hyundai Creta remains unchanged and continues to get split tail lamps. The new 17-inch diamond cut alloys are also new and make the Creta SUV look more sporty. However, these 17-inch wheels are available only on the top variants. The lower variants continue to get 16-inch alloy wheels. Inside the cabin, the Hyundai Creta facelift comes with an equally stylish appearance as the exterior. It gets multifunction steering wheel, analog and digital display consisting large instrument cluster and a larger touchscreen infotainment system with Apple CarPlay and Android Auto. In terms of space it comes same as the pre-facelift version. However, the addition of the sunroof in higher trim, updated seat and upholstery material along with silver accents at various places increased the premium appeal of the SUV. On the inside Hyundai has left no stone unturned to make sure prospective customers are tempted enough to put down their money for this one. The dual tone cabin looks nice and gives you a sense of premiumness – this is also evident from the layout and long list of standard features. Front seats are very comfortable – you also get a front arm-rest along with lot of places to keep knick-knacks. Space in the 2nd row is generous for this segment and you get rear a/c vents unlike in the case of the Duster. Visibility is good for rear passengers and finally, there is ample boot space for weekend drives. The power out of all three engines are exactly the same as the engines of new 4S Fluidic Verna. The 1.6 litre petrol has an output of 123 PS with 155Nm of torque, the diesel 1.6-litre delivers 128 PS and 260 Nm of torque, the 1.4-litre diesel churns a maximum of 90 PS with 220 Nm of torque. Hyundai will offer Creta petrol with 6-speed manual, while the diesel 1.6-litre engine will be offered with 6-speed manual or optional automatic gearbox. The 1.4-litre diesel engine will get a 5-speed transmission. The diesel automatic returns a phenomenal fuel efficiency of 21.1 km/l. No details were given about the other variants.The diesel manual takes just 12.3 second from zero to 100 km/h. The car is quick and is fun to drive. The diesel automatic did the same run in 13.2 seconds. The petrol engine returns 15.29 kmpl of mileage. The 1.4-litre CRDi engine generates 21.38 kmpl of mileage, while the 1.6-litre diesel engine returns 19.67 kmpl and 17.01 kmpl for the manual and automatic variants respectively.The Hyundai Creta with a 1.4-litre diesel engine is the most frugal of all the variants with an ARAI-certified efficiency of 21.38kmpl. The 1.6-litre diesel with Manual Transmission returns 19.67 kilometres to a litre as per ARAI. The automatic variant of the same engine has an efficiency of 17.01kmpl while the 1.6-litre petrol engine of the Hyundai Creta has an ARAI-certified fuel efficiency of 15.29kmpl. In terms of performance and handling quality, the refreshed Creta comes pretty impressive.The Creta is very light in weight, thanks to its hive structure that makes the car lighter and increases the stiffness at the same time. The driving posture is very nice. Even though the suspensions are on a softer side – just like any other Hyundai vehicle, the Creta has handles better because of its stiff body. Overall road manners and impeccable. Hyundai has put 6 airbags in the top variant including two in front, curtain, side and front knee airbags. There is keyless entry and push start button but the sensor on the door is only on driver side. The top-end variants get ESP and ESC while the ABS is standard across the variants.Another segment first is the ISOFIX seat compatibility in the Creta.Hyundai has created one of the best equipped cars in the segment and with the Creta, Hyundai has made sure the safety never gets out of the sight. The brakes on the Creta are solid and confidence inspiring. Even under hard braking, the car holds its line. ABS along with EBD come as standard across all variants. The top end version of the Creta gets 6 airbags along with electronic stability control, vehicle stability management control and hill start assist. The middle trims get parking sensors while the top trims get reverse parking camera as well. We think the Hyundai Creta facelift will be able to garner attention of the buyers across the country. It gets a refreshed styling and new features. Also, the pricing too will play key role.The changes on the new Hyundai Creta might not be extensive but has enough to make the SUV look fresh and new. It certainly looks more matured and muscular than the previous model and is more aligned to Hyundai’s flagship SUV in India – the Tucson. The price of the 2018 Hyundai Creta has gone up by about Rs 15,000 and is totally worth the value. The company has almost received close to 15,000 bookings on the new Creta in less than two weeks of the launch, indicating it has been well received by its customers. 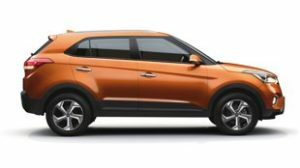 With the facelift, Hyundai will further build on the Creta as a brand and will appeal to both new and existing Creta customers in a better way.